You might have thought that an intelligent dog is your perfect sidekick for all your hunting endeavors. We'll, today is the day we fin you a new one - a well chosen multi tool. 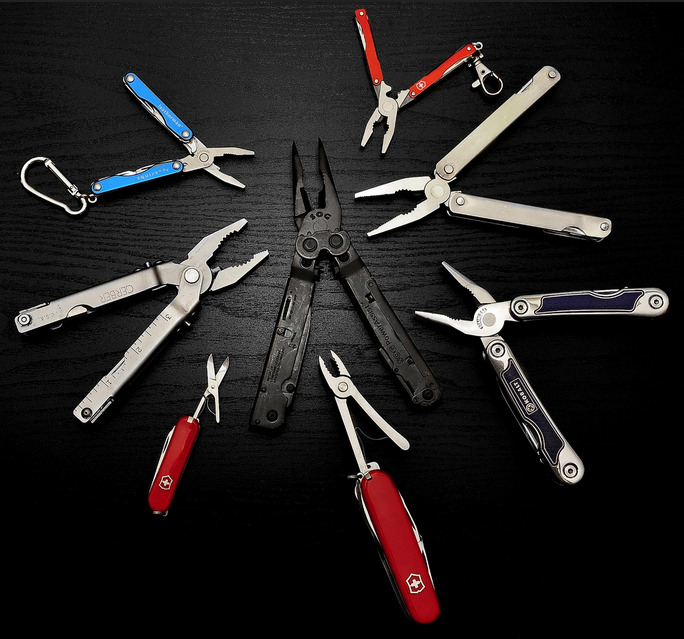 Some of you might already have it and the text will still make a good read about the DOs and DONTs of getting your money's worth, but for the others, this is where they learn the industry secrets of choosing the best multi tool while saving money. For many years, our good old standby was a trusty Swiss Army knife. It always had a big drawback though. Its blades don’t lock in place, and it was no strange occurrence for a hunter to cut himself using the blade. The next multi tool generation, embodied by Original Leatherman 200 brought us the locking blades, which made their use far safer. They brought us many other features that proved to be very convenient on more than one occasion. We’ll mention the pair of pliers, for example. The ratio behind this thinking was that pliers will certainly do more good to a hunter than a corkscrew. The big problem this generation had is the fact that a hunter had to manipulate the tool in an open position (by whichever way the design mandated) to get to even the simplest of tools, such as the blade. Fortunately, some big companies, such as Leatherman and Gerber saw this as a pretty constricting limitation, especially since you’re often in position where you want to be able to use your multi tool with just one hand. Leatherman solved this problem with a revolutionary “Wave” line of multi tools, which featured two blades, easily accessible with one hand. So, if you ended up in the great outdoors with a broken limb, heavens forbid, or was otherwise incapacitated, you could still access these blades by simple flick of the wrist. This was a short lesson in hunting multi tools history, but its principles are still applicable today. When you hit the stores searching for your perfect hunting companion, you don’t want to buy one that has some problems long ago rectified by better models. This is my kind of approach. Instead of yapping on and on about all the different things you should be looking for, I decided to give you some specific examples. I’ll show you concrete multi tools I would bring any day with me, and I’ll let you do the math and decide which components fit you bill the best. I’m not advocating that you buy any of these, they’re just here as a reference. Once you see how a good hunting multi tool looks like you’ll be able to pick one that’ll fit your needs and preferences. You’ll know exactly what to look for. Ok, let’s not waste any time and start doing some actual work. 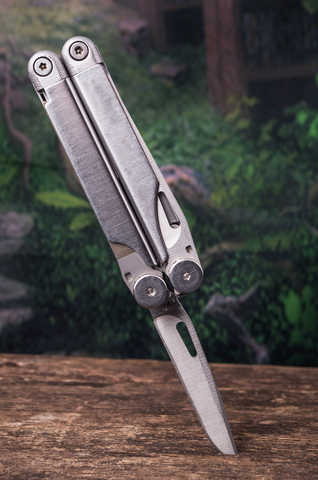 Now this is a multi tool you can count on in every hunting situation. It features ten different components, it’s very lightweight and compact, and it will fit your pocket or a keychain without a problem. The components are external, and they have a nail nicks to be as accessible as possible. You see the improvement in the accessibility department I was talking about. It’s made for survival and hunting, with the accent on survival, so it also features a survival pocket guide written by Bear Grills himself. Doesn’t hurt to have handy, you never know. There is a lot to be said about this tool. It is truly a revolutionary piece, and if my list here were quality and popularity based, it would certainly take the first place without second thoughts. It’s probably the most commonly used multi tool for various purposes, one of them being hunting. You can probably guess that all of the blades are locking safely once they’re in business mode. There are four essential tools on the outside, strategically positioned there for easy access with one hand. It features 2 pliers (yes TWO! ), wire cutters, 2 knives, scissors, saw, 2 files, screwdriver, bottle and can opener and many other useful tools. It’s simply all you can possibly need packed in one high-quality multi tool, save the rifle or a bow (if you’re into those sorts of hunting). It’s 100% stainless steel with no plastic or rubber parts whatsoever. It’s a hard-core tool, and it demands respect. Gerber again. With one more terrific sidekick for all your hunting expeditions. Its features are pretty straight forward. It’s a simple tool made to offer countless uses and applications. It features 11 different tools including Fiskars scissors and wire cutter. It’s ultra compact, so if that’s what you’re after, this is a model for you. It’s only 5.75” long and 1.2” wide. It weighs only 6 pounds, and the construction is solid stainless steel once more. The company also offers a limited lifetime warranty on this one, so you know they are ready to stand behind their product. I think you got the point by now. Bottom line is, you want a high-quality multi tool that features some mean, razor-sharp blades that are easily accessible with one hand. You want it to be sturdy and made off as much steel as possible. You don’t necessarily want a gazillion of different tools inside it. The basic package is quite alright, provided that it all functions flawlessly. Just picture it in your head, what kind of jobs will you want your new multi tool to perform and go with that. Now when you know how a good hunting companion should look like, it’s just a matter of your personal preference. Now, I can't tell you which tool to buy, the last step would be to read some reviews of these multi tools, and identify yourself with other people's experiences.